The aquarium came without lights or a lid to it, for the lid I obtained a sheet of clear PVC and cut it into two pieces and trimmed it to size, so that there is plenty of overlap in the middle. When I put the first piece in it had a noticeable dip in it towards the middle of the tank, when I trimmed up and fitted the second piece it to fitted in the same manner, I was just about to start trimming off millimetres when I realised this would work in my favour by redirecting the condensation back into the tank and away from the edges. The lights are the Fluval P36 LED switchable white for day and blue for night time, this is an adjustable light and will fit tanks from 36 inch, as my tank is a non-standard size, the normal off the shelf fluorescent tube light assemblies just would not fit. All components obtained from http://www.co2art.co.uk/ who offered invaluable information and assistance in this part of the build. The gauges show CO2 bottle pressure and aquarium line pressure, come with a solenoid to turn the flow on and off, this will be plugged into a 24hr timer switch so the CO2 is not wasted when the lights are off as the plants only use it when photosynthesis in light. Next is the ‘Bubble counter’ this gives you a visual guide to how many bubbles of CO2 per second are being released into the water. This is the ‘Bazooka’ that diffuses the CO2 into the water by virtue of reducing the bubble size to that which will more easily dissolve into the water. This will most likely be put into the third section of the sump along with the pump and heater. Of course to connect all these together you need some tubing, ordinary air line will not do for this for two reasons, first being that normal airline will be broken down by the CO2 and secondly it is not pressure rated, so the tubing pictured is specifically designed for use with CO2. Obviously once this is all setup and running I need some way to monitor just how much CO2 is dissolved in the water, thankfully there is a nice easy method for this, by use of the ‘Drop counter’ filled with ‘4dKH’ and ‘Indicator liquid’, what this does is colour the 4dKH blue, it turns yellow for too much CO2 and green for just right, which means even an amateur like myself can get reliable readings at the glance of an eye. The ‘Drop counter’ in situ in my aquarium and working, as you can see from the blue colour right now I have nowhere near enough CO2 in the system. So the only thing left out is the Fire Extinguisher, yes Fire Extinguisher! I imagine a few people scratching their heads wondering why a Fire Extinguisher, well if I were to buy an ‘Aquarium 2kg CO2 Cylinder’ they start at around £50 plus P&P, due to the weight the P&P is usually around £10-£15 giving a total between £60 and £65, however a 2kg Fire Extinguisher cost me £21.95 including the P&P! one fire extinguisher should last around 6 months, so even if I used it and threw it away and bought a new one, it would take 12- 18 months to get to the same cost, remembering that a CO2 fill costs around £10-£15 the savings are immediate and ongoing if refilling. There are a number of ‘grades’ of CO2 and from the posts on various fish forums the plants are not that particular, they are happy with CO2 at whatever grade. 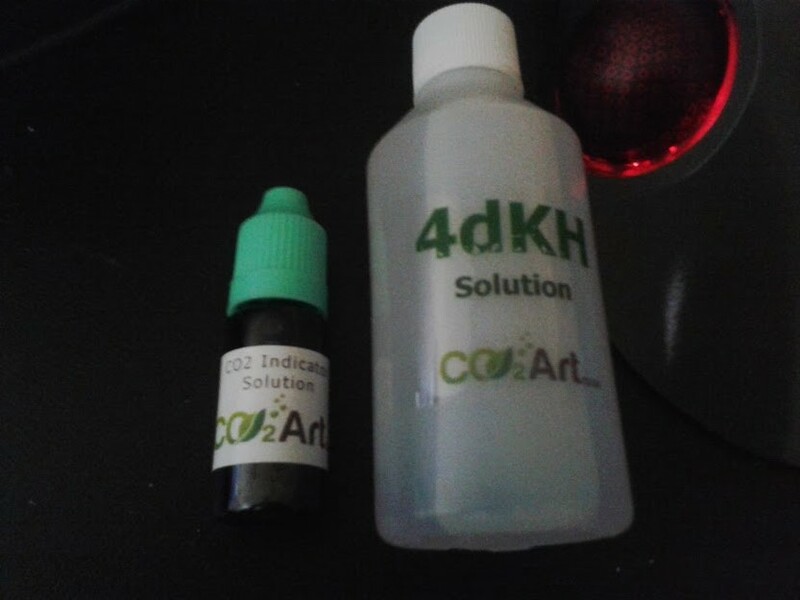 Thanks go to CO2 Art for the initial advice in this direction. There are a number of ‘How to’ videos on youtube, but basically it is 1. Take the horn off and 2. Install the gauges, hey presto you’re done. This is the only piece of the system yet to arrive, it is on order and expected any day now. Whilst waiting for the aquarium co2 system above to arrive I am using a disposable cannister system, this consists of an in-tank diffuser and an aerosol can. Each day you need to ‘fill’ the CO2 chamber of the diffuser and it dissolves into the water during the day, the problem with this method is that you have to guess how much will actually dissolve into the water during the day (time with lights on in the tank) and is very hit and miss to say the least, I have been using it for over a week now and as yet not one day did it dissolve all the CO2 during the day, which means that some of the CO2 is dissolved into the water when the plants are unable to make use of it and hence a lot of the CO2 is wasted. Aerosol cannister attached to back of tank with Velcro fasteners. In theory this should last about a month it costs £25 for 3 cans and can only dissolve into the water at the CO2-water interface within the small chamber, which obviously means you have no real control. once charged it is on until it exhausts the CO2, if the CO2 levels are too low (remember the blue indicator fluid in the drop counter above) then there is nothing you can do to increase the amount dissolved in the water, whereas with the full system it will be on a timer and there is a flow control on the CO2 which is measured by means of the bubble counter.